There are many “fair weather sailors” who will go out for a weekend with a few apples and claim to eat fresh. But when multi-week passages are concerned, and produce conditions are likely to deteriorate to high levels on the “BeauFruit Scale”, real sailors show their true colors! In the worst food storm since “Bananagedon”, the crew of Aldebaran found themselves at bedtime with a rotten bunch of gooey fruit sliding around the closet. It all began with the port bench being a little wet. Recall that the wind is always blowing over the port side of Aldebaran – from the East, as we head South-West – so all the waves wash over the port side of the boat. Our hatches need new gaskets, so they leak some water into the “wings” and those leak onto the port benches. An unfortunate problem for sure! Get off your lazy bum, Capitan, and install those gaskets. Unfortunately we had consumed the first papaya (and checked it off the inventory) but for some reason we thought both had been eaten. As we all know papayas go off quickly. As it melted in its rotting goo, it afflicted everything it touched — including a beautiful large watermelon, which disintegrated in half, and our second to last pineapple, which became fermented nastiness. Invoking emergency powers, the captain stopped all activities onboard until the rotten fruit was dumped overboard in the darkness for the fish to enjoy, and the crew began the arduous cleaning of the bins. One bright note: we discovered that Michael doesn’t have a well-attuned sense of smell, as he hasn’t been bothered by the odors emitted by the food being stored in the vicinity of his sleeping quarters. We are all envious of his lack of smell right now. The conditions were waaay too rough during Papayagedon to take pictures. So I hope you enjoy another image from Bananagedon, which was perhaps a “3” on the Beaufruit Scale, compared to Papayagedon’s “6”. 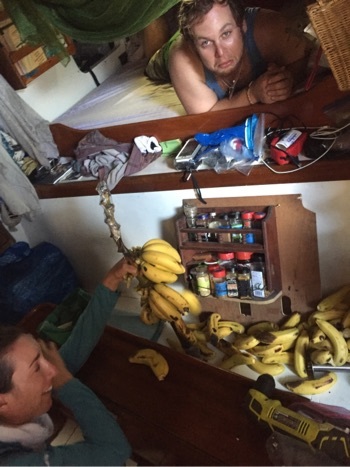 This is of course the traditional measurement for fruit deterioration aboard a vessel. Y’all can share your stories below in the “Respond” section of produce disasters, and their BeauFruit Scale for comparison! Oh no. I have papaya PTSD serious gag reflex when I smell one rotting. I still can’t quite bring myself to eat them anymore. All rotting fruit and food is horrible but papaya is especially bad!! It must be tricky organizing produce supplies for a long trip like yours. We have a bit of the same problem here on Maraú. We go shopping for fresh produce every 10, 15 days. When we return from town, our baskets bulge with beautiful fruit, our fridge is then stuffed with the more delicate stuff. In a few days, we start checking to see what needs to be eaten first, what needs to go into the fridge. One by one. Every day. The bumping of the boat surely increases the problem!